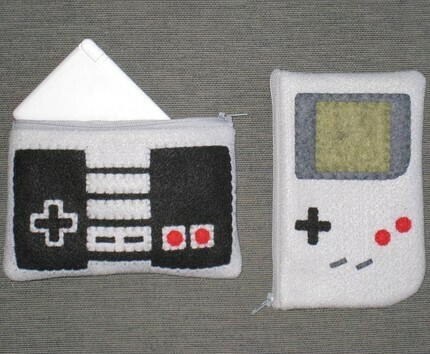 Handmade Classic Nintendo DS Cases | OhGizmo! By Chris Scott Barr on 10/08/08 • Leave a comment! Alright, now this is how you make a case for gamers. The knitted case I wrote up at the very beginning of the month was an example of a case you buy for your Grandmother. Now if you’re looking for a case for your DS then you’ll love the seller Janis13 on Etsy. They are currently selling 15 different very cool pouches. Some featuring classic Nintendo designs, others look perfect for Halloween featuring Frankenstein, his bride and a very cool pouch with skulls and crossbones on it. All of which feature a zipper enclosure to make sure your DS stays secure. The cases are all sold for $13, but you can get the set shown above for $21 which is $5 less than if you were to buy them separately.